Week 3 of San Francisco Open Studios features South of Market (SOMA), my neighborhood, and Mission Bay, the corridor along 3rd street further south. This is a rather large piece of territory within the city, and a mixture of old industrial areas and downtown that seems to me very creative. I have decided to divide my experience into three distinct sections: abstract, architectural/urban, and figurative/characters. These are by no means authoritative groupings, they just represent the main areas of my interest among the work that I saw, and a way to separate the large number of artists I saw into something a bit more manageable. And of course many of the artists blue the boundaries between these distinctions. This article presents a few of the artists whose work was primarily abstract. At South Beach Studios, I once again visited the studio of Paule Dubios Dupuis. I had seen her work last year when I was specifically looking for large abstract paintings, and indeed her rich and vibrant canvases were once again among the largest I saw this weekend. 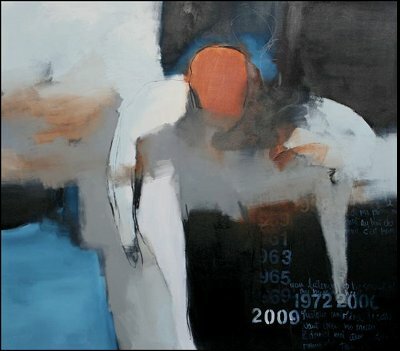 Her paintings feature shapes and areas of color of different sizes with soft of ambiguous borders – the content has a very expressive, even emotional, quality. Her smaller “Graffiti” series is very crisp and tight with shades of black and grey; her exceptionally large Pour toi maman is simultaneously study in color, shape, and use of text, and a moving tribute to her mother. At 1035 Market Street, I encountered the work of Clare Kuo. 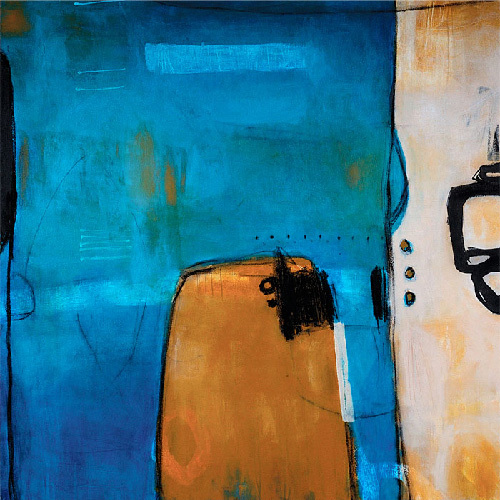 Her large abstract paintings have very strongly defined shapes and boundaries, with large fields of color. Within each, one can see different shades in the brush strokes and fine detail, but it is the large outlined shapes that most stand out. Conceptually and texturally, her paintings remind me a bit of Silvia Poloto’s Observations series (from Open Studios week 1), but with a different vocabulary of shapes. Also at 1035 Market, Andrzej Michael Karwacki presented both abstract work as well as figurative work, and indeed I did not initially realize they were from the same artist.Karwacki keeps the two bodies of work fairly separate, and noted that the viewers and clients for his abstract and figurative work fell into two very distinct groups. So perhaps I was an exception in having an interest in both. 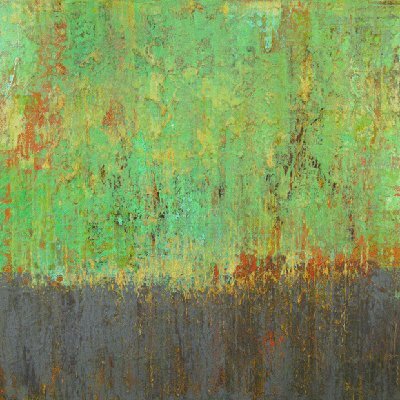 His abstract work was very textural, with brighter natural colors often running down the canvas in a manner that suggests water running down the side of a wall. Some of his paintings also feature plant shapes and patterns. His figurative paintings, by contrast, had a very crisp feel with well defined lines, and reminded me of fashion and glamor photos. These images also incorporated text in the form of poems printed in the background. One of my favorite “spaces” from the weekend was Pier 70, a collection of dilapidated port and industrial buildings in Mission Bay. I featured one of my own photos from this area in last week’s Wordless Wednesday, and will have more to say about it in a future article. I did see several artists at the Noonan Building at Pier 70, including Phillip Hua. 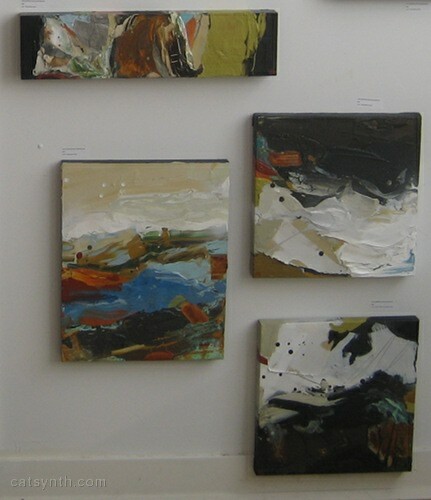 I have seen Hua’s abstract work from his De/Construction series before at Hang here in San Francisco. I was attracted to the large shapes lined with smaller dots and splatters; and stark coloring with broad areas of black set against white and bright colors. His more recent work, re:Action involves ink and tape placed on top of pages of the Wall Street Journal. The images of trees that emerge suggest the “reclaiming” of the Journal pages. The newspaper was created from trees, and now it is being used to recreate trees. In a lower level of the same building, I found the work of John Haines. 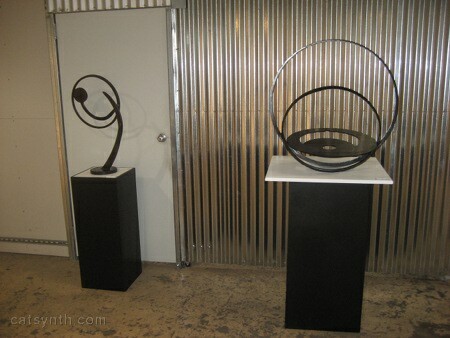 His metal sculptures feature soft curving lines, circles and smooth textures. 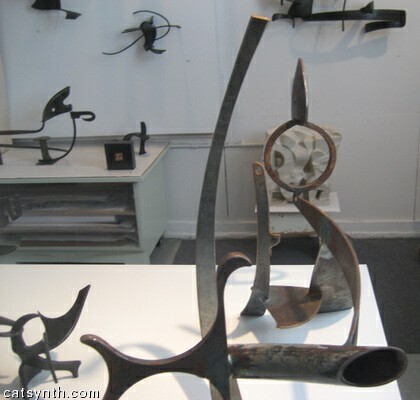 The abstract metal shapes have a very organic feel and the thin lines in some of the pieces convey a sense of motion. It also was fun to try and use the circles as “windows” through which to peer at some of the other sculptures. It seems that I always end up being drawn to abstract metal sculpture, and thus I ended up again this year atIslais Creek Studios. Some of the artists I saw last year were not showing this time. But I did see Rebecca Fox’s large metal sculptures. Her arrangements of almost perfect circles and other curvilinear forms in arrangements suggest astronomical symbols. The shapes and surfaces have a very smooth, continuous quality to them. They also have a feeling of strength when viewed in person, even some of the pieces composed of thinner circles. Nearby, Yong Han’s sculptures provided a stark contrast. If Fox’s sculptures are represent simplicity, strength and circles, Han’s are intricate, delicate and very linear. 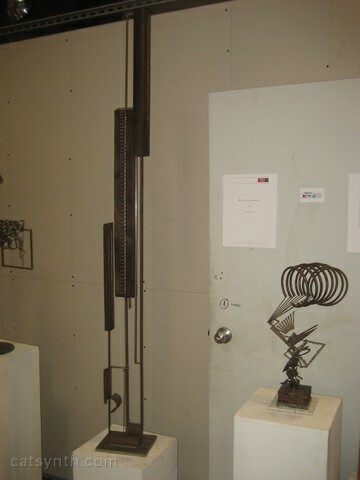 Several of his sculptures featured complex arrangements of wire, bars and rods, sometimes vertical and sometimes at odd angles, and sometimes quite tall. Although not necessarily the tallest of his sculptures, I liked this pair as they reminded me a downtown city block. Back in SOMA. 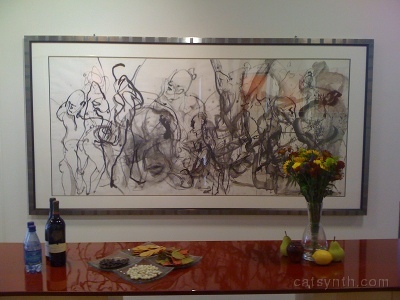 Reiko Muranaga’s drawings blended figurative and abstract shapes, such as in the large charcoal-and-ink drawing Session. One can focus on either the thick black curving lines, or the figures that emerge from them. This piece in particular seemed to fit quite well with the red table in front of it. She has also composed some exceptionally large scrolls of her drawings, although these were not on view. Muranaga also presented her Letters to Monet series features soft fields of colors (light reds, oranges, blues) overlaid with very detailed brush strokes suggesting birds or plants. At Garage Studios on Bryant Street. Alan Mazzetti’s paintings feature a very geometric vocabulary with clearly delineated shapes and textures. Although the linear and rectangular shapes stand out from a distance, up close one can see the the defining elements are the circles. 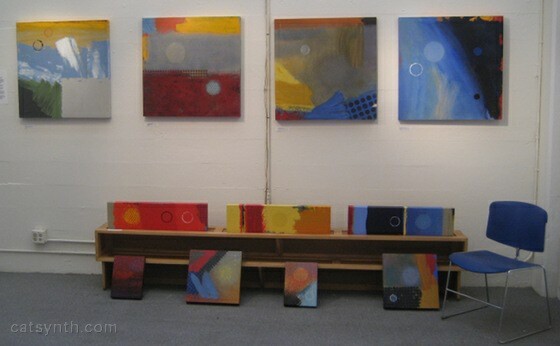 There the large and clearly visible circles, but also the arrays of smaller circles that together form larger objects, and the circles that are hidden in the textures of the paintings. At SOMA Studios Mark Harris presented an interest mix of purely abstract work from his Letting Go series featuring energetic curved lines, and prints that ranged from abstract to overtly political. Some of his prints were recycled from previous trials, on which he placed text elements including his iconic “signature” shape. I had initially seen Jeremy Garza’s work as another example of the use of text in abstract art, with his shapes that resembled a sci-fi language. This was apparently a coincidence, though he noted I was not the first person to point that out during the day. A few artists blurred the distinction between abstract and architectural (actually, several did whether intentionally or not, like Yong Han’s sculptures above). 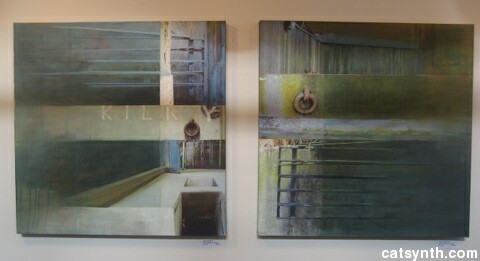 From a distance, some of the paintings in Nanci Price Scoular’s “journeys” series look like abstract color fields with soft muted tones, but on closer inspection they are revealed to be details from structures, such as the “urban still life” pieces featuring rusted iron rings and gates. Samantha Ricca also crosses the boundary between abstract and architectural, with one series of paintings featuring surved, organic, almost corporeal shapes, and another featuring featuring straight lines and sharply delineated outlines of structures, such as a ferris wheel. Ricca’s studio was back at Pier 70, and a fitting place to conclude until the next article, which will focus on urban and architectural art.